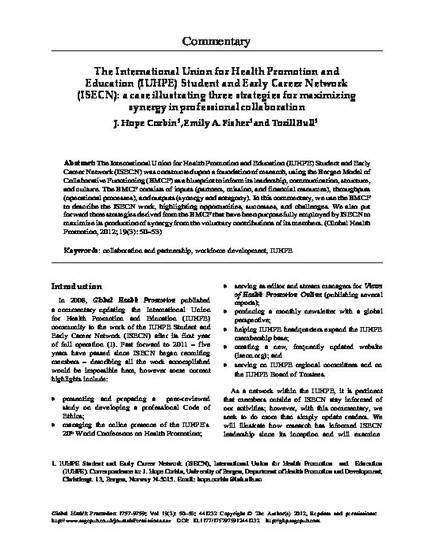 The International Union for Health Promotion and Education (IUHPE) Student and Early Career Network (ISECN) was constructed upon a foundation of research, using the Bergen Model of Collaborative Functioning (BMCF) as a blueprint to inform its leadership, communication, structure, and culture. The BMCF consists of inputs (partners, mission, and financial resources), throughputs (operational processes), and outputs (synergy and antagony). In this commentary, we use the BMCF to describe the ISECN work, highlighting opportunities, successes, and challenges. We also put forward three strategies derived from the BMCF that have been purposefully employed by ISECN to maximize its production of synergy from the voluntary contributions of its members.